I’m really trying to stay off grid the majority of the time on this trip around the central north island of New Zealand. I’m still finding my way and figuring out what the best systems are. Learning about the quirks of solar panels, caravan showers and all about water. I’m also pushing my boundaries and going out of my comfort zones with campsites – staying at cheaper places means I can travel for longer. 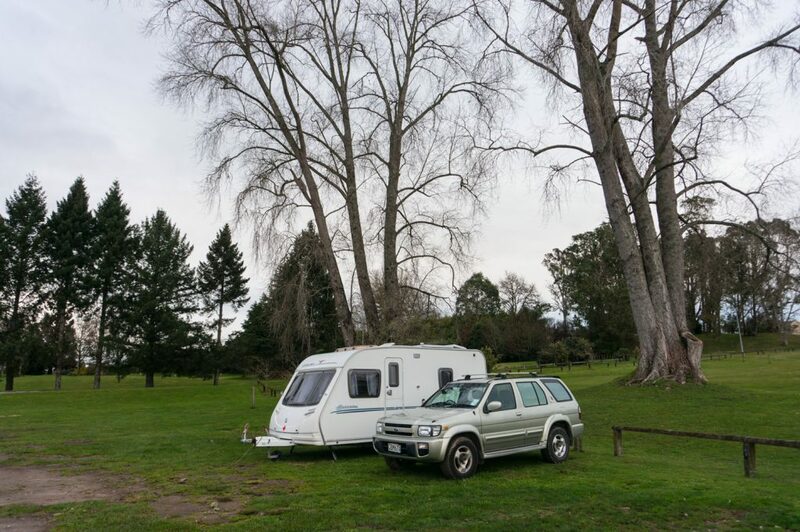 The first campground was in Okoroire just outside of Tirau, New Zealand. 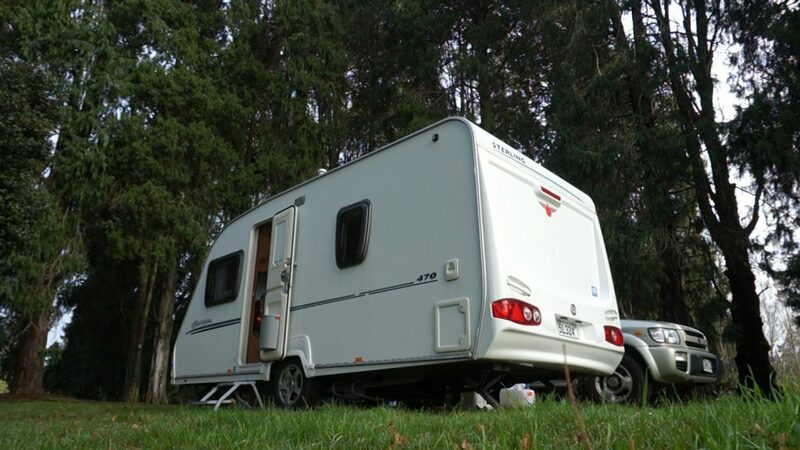 It had a nice write-up on CamperMate and only cost $10 a night – a bargain. There is a chain for a gate, 2 ladies toilets with no seats, one shower to share for the whole campground and a communal kitchen. Basic but a really nice private country setting. I’d previously rung to check that the grass wasn’t too wet to park on – it’s winter and has been raining a lot. The top area was fine. There were two other vehicles parked around the building, so I went for a grassy spot to the back with a bit more privacy. Little did I realise that this private area got no sun throughout the day! I left to explore the Blue Springs, and when I got back, the battery percentage had actually gone down! It was now at a dangerous low battery level of 66%. My type of battery should only go down to 75%. 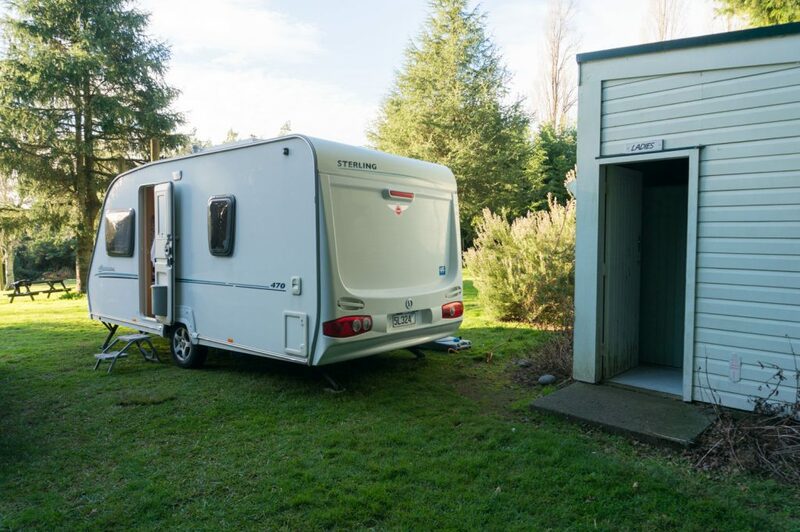 Once I finally realised my shady problem, I was able to move the caravan right next to the womens toilets where I was able to plug in for power. I made the most of it – heater, kettle, toaster, laptop, internet and charging my camera battery all at once, heaven. But my privacy was gone. Pros and cons with both spots. I had been struggling with what to do about my grey water tank. It is too heavy for me to easily get into my car boot with dirty water in it, to then take to a dumping station. I want to follow the rules of not emptying the water under a tree but couldn’t think of a solution. What I’ve ended up doing is having two smaller tanks that I can lift into the car – an easy solution! This was my first proper freedom camping spot. It’s right by the lake, with toilets and a cafe. You can even pay at the cafe and plug into power by the toilet. But this time, I wanted to make my solar panel system work. The first day rained non-stop and my battery hardly charged, but I refused to move again. 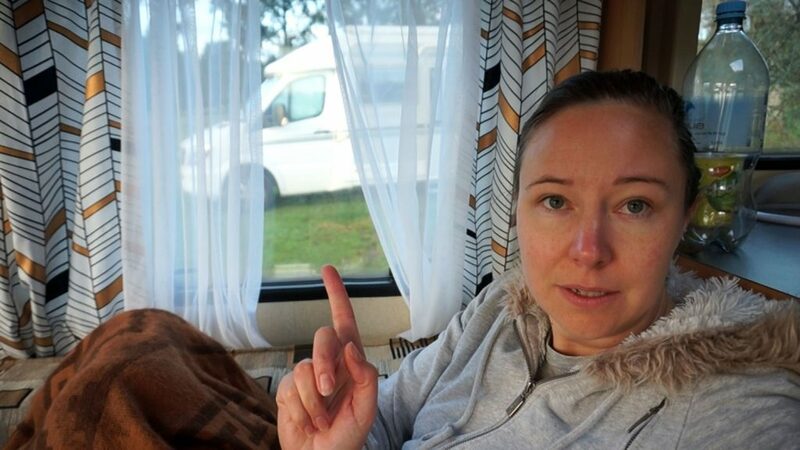 It’s such a hassle in a caravan and it wouldn’t be as enjoyable parked right by the toilets. I was starting to get concerned that I couldn’t fully charge in winter. The next morning there was an amazing sunrise. I was out of the caravan at the lakes edge. This is one of the great things about living in a caravan. You can park right by amazing natural sights and see them from the comfort of home. I’ve never been so successful with sunrise photos. The sun came out and the battery charged to 100% by midday. I suspect I’ll be observing the weather more closely from now on. I tried out the shower in the caravan. It’s a combination shower / toilet with a sliding door to stop the toilet getting wet. It’s an ok shower, but only designed for short showers. Really makes you realise how much water you use. I don’t think I can wash my hair in it. The water is heated by gas and I’m wondering how long a gas bottle will last. My second shower – I ran out of water halfway through. I’ll make a point of checking the water level in the outside tank before starting a shower in the future. I had wondered if I would feel safe in the carpark at night. There is no gate and anyone could wander around, even right up to the windows. In theory, people can do this with any property, but having a fence or even a property boundary makes you feel safer. The first night, two other vehicles turned up, which was reassuring. The second night, no other vehicles were there when it started to become dark. I was mainly confident I wouldn’t become a scared wreck, twitching at every rustle, but a vehicle turned up later in the night. No testing my resolve this time. I’ve come to realise I feel very secure when I lock my caravan door at night. I actually feel safer in the caravan than I do in hotels – at least you know no one else has a key. I finally tried an NZMCA campground and after this experience, I plan to stay at others in the future. The NZMCA campground is for NZMCA members and are scattered around New Zealand. A perk for joining. You need your members stickers and be self contained. They don’t have facilities – no toilet, rubbish bin or dumping station. The ground was a little muddy from all the winter rain, but no problem with my 4×4 car. There was one other vehicle when I arrived, so I parked with plenty of distance between us. There were some orange trees laden with fruit, which I helped myself to. I was ridiculously excited by getting free fruit, and I think being able to pick them myself made them taste better than normal. The one down side with the campground was the traffic noise. It was right next to one of the main highways and you would hear all the trucks struggling up the hill. The first day there, I realised I had managed to pick the shaded spot again. The other vehicle was in full sunlight, while my solar panels were still in the shade. I suspect they had been here before! Well, now I know for my next visit. An hour later, the sun rose above the trees. There was a dumping station 5min down the road for my dirty water and to collect fresh water. Since starting to have showers in the caravan, I am definitely going through more water. I’m enjoying these types of campsites with more space and privacy and plan to keep staying at similar places. When arriving at a camping spot, I need to get into the habit of learning where the sun will go. I haven’t been successful so far. I’m also hoping that with a better battery, I’ll have a couple of days leeway on rainy days, instead of needing to reach 100% every day. I’m wondering if it’s worth getting a generator for peace of mind, or are they too expensive, noisy and heavy? The smaller grey water tanks are working really well. Having two tanks mean there is less urgency to empty them instantly. I might even get a third. My one tip is to check that the tank hole is large enough for your hose. The shower is fine for a short rinse, but not good enough for washing long hair. Multiple issues – the more water used the more chores created, the water doesn’t drain fast enough, and I’m still wondering how long the hot water lasts. For now, I interweave visits to campgrounds with showers and tracking down organisations that allow you to pay for a shower. I’m feeling more comfortable than I expected staying on my own with no close neighbours. 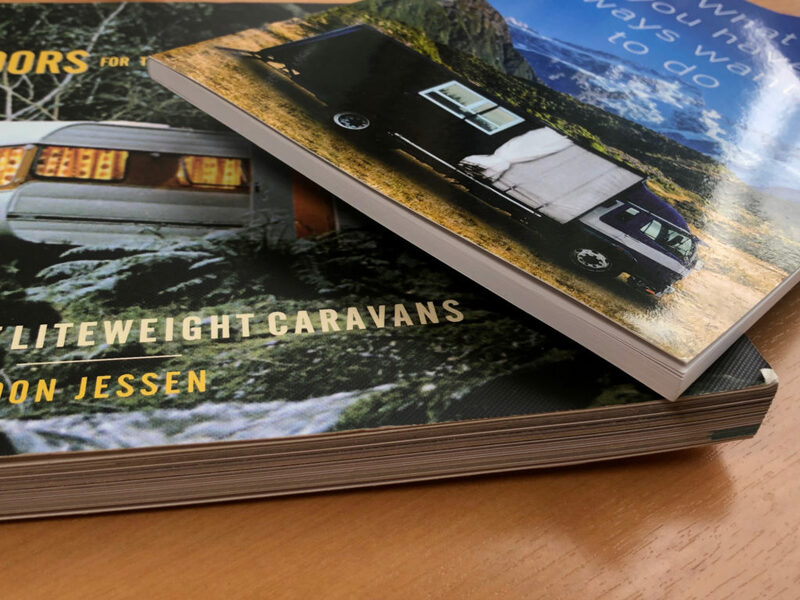 I think a large part of it is how secure the caravan feels once the door is locked. I’m sure there will be times in the future I wont feel as safe – but I’ll have to trust my instincts. I’m trying out other campsites on this trip too and will share my findings soon. 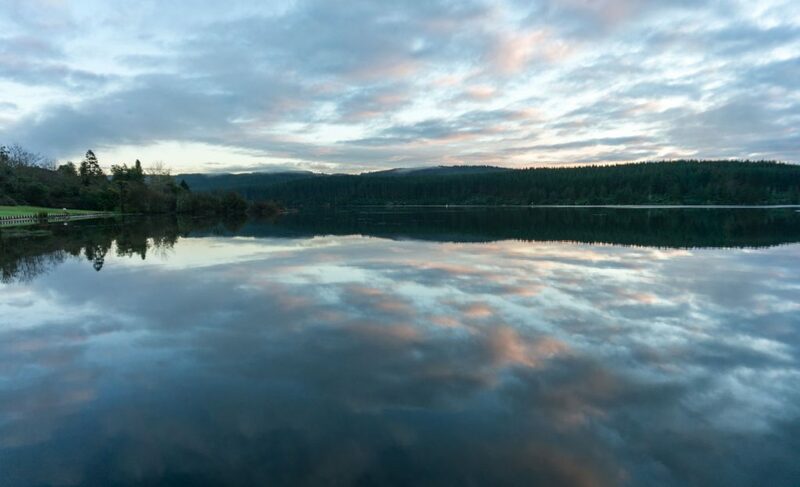 Do you have any favourite camping sites I should try? Leave a comment below.